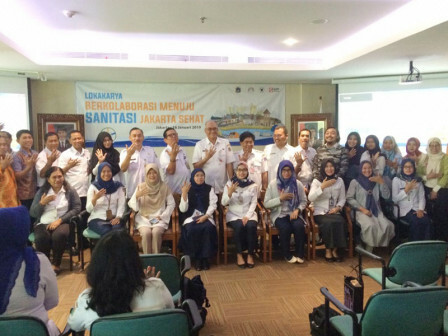 Around 100 participants from various elements are participating in a workshop titled collaborating towards sanitation for healthy Jakarta at City Hall, Jalan Medan Merdeka, Selatan, Gambir, Central Jakarta.
" I believe sanitation issues can be solved in three until four years ahead"
Those elements are regional working units (SKPD) and regional-owned enterprises (BUMD), national development planning agency (Bappenas), health ministry, consortium representative for community sanitation program (Simaskota), national network of drinking water and environmental sanitation, and other stakeholders. Oswar Muadzin, City Deputy for Spatial Planning and Environment said that it is held to dealt with sanitation issues in Jakarta. "We also have a large design of supplying drinking water and domestic wastewater treatment," he expressed, Wednesday (1/16). Based on Jakarta Health Department's study results per November 2018, 4.74 percent of residents are in the category of open defecation. "Aside that, most of the residents' septic tanks are far from standards and dangerous for health," he told. Collaborating with private parties through corporate social responsibility (CSR), he assessed, Jakarta Provincial Government conducts Simaskota program trial for helping residents to get sanitation access that is decent and healthy. "It is done in RW 06 area, Tebet Timur Urban Village and RW 10, Pademangan Barat Urban Village. It has been running since October 2018 and will end in September 2019," he told. Hopefully it could speed up the achievement of universal access in the sanitation sector and the SDGs target in 2030, especially in Jakarta. Moreover, the city also plans to build a wastewater treatment plant (IPAL) at several points and designs an Integrated IPAL in 15 zones. "Many investors to support. I believe sanitation issues can be solved in three until four years ahead," he said.